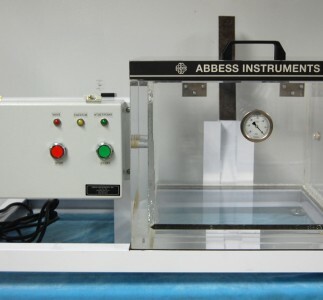 The full array of Abbess components and methods are available to meet recognized industry standards in package testing, as well as customized protocols required of specifically demanding industries or unique and innovative products. Abbess Systems have played a part in testing the packaging for potato chip bags and shampoos bottles (simply being trucked over high mountain roads) and satellite optic housings launched into deep space. Abbess has the industry knowledge to match the system to the test. FDA compliant specialty coatings are available for food testing and medical product material tests. Abbess Control Systems with integrated data log testing capacity can be configured to end-user needs whether exploring product behavior and packaging prototypes or meeting demanding production scale. For simple degassing systems, see our Degassing Kits. To test your product under a range of atmospheric conditions, see our Altitude Testing systems. For filling a product under vacuum, see our Filling Systems. To produce a strong heat seal on your product, see our Sealers.